Welcome to the first installment of Creators Going Pro, where in partnership with Semaphore — a creator focused family of companies providing business and financial services to social media professionals — we profile professional YouTube stars who have hit it big by doing what they love. Each week, we’ll chat with a creator about the business side of their channel, including identifying their Semaphore Moment — the moment they truly went pro. When veteran YouTuber Tyler ‘Logdotzip’ Pappas joined the video sharing site in 2006 at the age of 14, he didn’t intend to make a career of it. Yes, his early videos (mostly about the massively multiplayer online role-playing game Runescape) attracted an audience, but Pappas found his dedicated fanbase years later (and like so many other gaming-oriented creators), when he started playing the sandbox video game Minecraft. 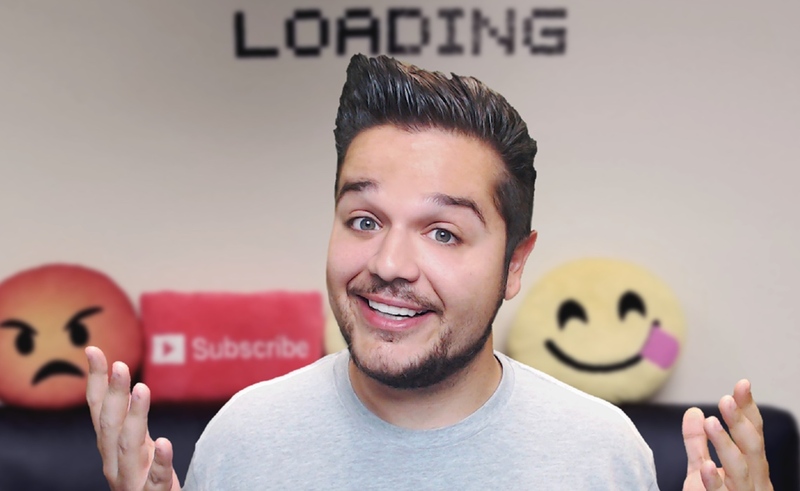 Now, Pappas has made thousands of videos, amassed nearly 630 million views, and has more than 2.5 million subscribers tuning in for his daily uploads on his flagship YouTube destination and burgeoning second channel (dedicated specifically to videos around Minecraft‘s mobile iteration). But everything he’s accomplished thus far — including those views and a business with a headcount pushing into the teens — goes back to that one decision to create a YouTube account 12 years ago. Tubefilter: You started your YouTube channel at 14, right? How long was it before you started to become serious about it? Tyler Pappas: Yes, that is correct. I started when I was 14, back in 2006. I spent most of my teenage years uploading gaming videos once every one – two weeks. During those early years, there weren’t really any widespread monetization options available to creators, and the YouTube partnership program was very limited in its scope and openness. It wasn’t until May of 2013 that I developed a serious dedication to the platform. I had taken about a six month hiatus from video making to focus on college and my job at the time, when my friend Adam (of SkyDoesMinecraft fame), whom I used to game and make videos with online as a teenager, had started seeing massive success on the platform with his Minecraft content. He and I met in person for the first time while he was in LA for a YouTube event, and after explaining to me how the platform’s monetization opportunities had evolved, he was able to convince me to get back into making content. Since that time, I have uploaded videos on a daily basis. TP: I first felt like a professional creator after I was recognized at a gaming convention for the first time. It was in late August of 2013 at Pax Prime (now referred to as Pax West), and I had about 50,000 subscribers at that time if I remember correctly. I recall being shocked that I actually ended up using the Sharpie I had brought with me to sign any autographs! I was about three and a half months deep into uploading daily videos. Life in general had been a whirlwind for me up to that point. I had been given the tough decision between sticking to the “traditional path” of going to college while working a non-YouTube job, or putting that on the shelf to pursue what I saw as one of the greatest opportunities of my life to turn my teenage hobby into a real job with a real future. Obviously, I opted to move full speed ahead with YouTube, and took my leave from college. I never looked back. Sorry mom! TF: When did you make the decision to build out your team? What was the impetus to do it? TP: I met with Mike Bienstock from Semaphore at one of the client lunches he threw during E3 in Los Angeles in 2016. I saw the work he was doing with other creators, and the opportunities his company was bringing to them. I had at that point been doing the same old daily video uploading for about three years straight. I had begun to wonder what light was waiting for me at the end of the metaphorical tunnel. What was all this time and effort invested going to lead me to? Was it going to lead me to anything at all? Mike explained to me that if I want to take what I had built, and do more with it, that it was time to get some help. You reach a point where you’ve pretty much used up the 24 hours you have in your day to conceptualize, film, and edit videos, as well as plan for future content. You realize that you as one person can only do so much. When that happened, I decided to start employing the help of others, effectively borrowing some of their daily 24 hours, in return for payment. I knew if I didn’t have a team to help me expand, I would never be able to take on more than what was already on my plate, and to me, the worst thing a creator can do is get comfortable with what they’re doing. TF: How big is your business now and what does it all include? How many people are on it? TP: It depends on how you count it, but there are at least 10 full-time employees and about 13 people total on the team right now. We have six people in house in the office. My Producer helps with creative development, scripting, and preparing content. He also handles a lot of the quality control and review process for our uploads, ensuring that we’re delivering quality content with all the correct metadata and tagging. Then we have two Editors working across my main Logdotzip channel and my new Minecraft Pocket Edition channel who handle all that workload. We also have a Graphic Designer who handles any graphical assets for videos, thumbnails, or merchandise, as well as our branding across YouTube and all my different social media channels. I also have my Executive Assistant who makes sure everything related to my day-to-day schedule is in order. Outside of the office, I have five full-time developers around the world working in different timezones who help code and create worlds and games for us to feature in our daily content, as well as distribute materials via the Minecraft Marketplace. Finally there are a few more important members who round out the team. Will Hanisch is my entertainment attorney who has been the bridge for a numerous amount of projects, Mike from Semaphore who handles my finances, helps secure branded content deals and other sponsorships, and assists with our general company direction, and James Haffner, my COO, who helped start SourceFed with Philip DeFranco. After overseeing his company for five years, he has started a brand new journey with me to expand our operations. My network Machinima also helps with sponsorship deals, as well as coordinating appearances and tours. We also have a small network of freelance editors and developers that we tap into if we have a big project coming up or if someone else is out of the office. TF: What’s next? What’re you building toward?